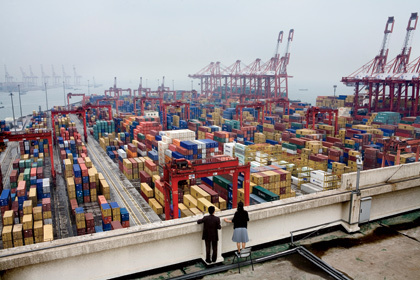 Wonderful article by James Fallow on Chinese factories. It runs long, but it stays juicy the whole time, because he’s giving you the details you want to hear. Anyone who has been to China is awed by the scale of production. How do they do it? And more importantly what will they do next? At the moment, most jobs I’ve seen the young women in the factories perform have not been “taken” from America, because in America these assembly-type tasks would be done by machines. But the Chinese goal is, of course, to build toward something more lucrative. Many people I have spoken with say that the climb will be slow for Chinese industries, because they have so far to go in bringing their design, management, and branding efforts up to world standards. “Think about it—global companies are full of CEOs and executives from India, but very few Chinese,” Dominic Barton, the chairman of Mc­Kinsey’s Asia Pacific practice, told me. The main reason, he said, is China’s limited pool of executives with adequate foreign-language skills and experience working abroad. Andy Switky, the managing director–Asia Pacific for the famed California design firm IDEO, described a frequent Chinese outlook toward quality control as “happy with crappy.” This makes it hard for them to move beyond the local, low-value market. “Even now in China, most people don’t have an iPod or a notebook computer,” the manager of a Taiwanese-owned audio-device factory told me. “So it’s harder for them to think up improvements, or even tell a good one from a bad one.” These and other factors may slow China’s progress. But that’s a feeble basis for American hopes.